I got Ravishing and Brave! Ravishing is described as a clean light peachy coral, and Brave is pink-beige with white pearl. Cat aka PLC, along with the sparklicious Devan at the MAC store, helped me narrow down to these 2 shades rather quickly. I think because of the hot weather outside, we were all feeling the brighter, more summery shades – I tried on Fanfare first but it was determined that it was “just average” by my PLC. When I applied Ravishing though, my PLC exclaimed, “that’s the one! It’s special!” And Brave was also an easy decision – it really brightened my face and looked quite natural against my skin tone. Interesting to note that I did not pick up any of the Amplified Creme finish as I originally planned to – Ravishing is a Cremesheen and Brave is Satin finish, and both feels great on the lips. Because I was worried about possibly duplicating some of the MLBB shades I already owned, I took along some lipsticks from my collection to MAC. I took with me: Guerlain Rouge G in Garance, Elizabath Arden Exception Lipstick in Breathless, and Urban Decay Revolution Lipstick in Rush. The Guerlain tube is resting on a metal widget thing I found. That lipstick tube is a challenge! Brave is brighter and pinker than these – it’s also a more opaque formula. And I can’t think off the top of my head a dupe in my collection for Ravishing, but I will have a look and do a comparison post in the future. So, why I redeemed for 2 lipsticks rather than 1 lipstick and 1 eye shadow was that I was semi-naughty and had gone to MAC a couple days prior to my visit with Cat. I was in need of concealer for my legs because I had recently suffered from a bout of hives that left my legs with discolouration. It’s been so hot out, and I wanted to wear a skirt… and I’m vain, ok! 😛 My coworker friend and I went to MAC over lunch and I got the Studio Finish concealer in NC25 along with a 2-pan palette to house it – I learned that some concealer shades are only offered in refill pans now? Not sure what I’m going to put in that empty slot. So those are my Back to MAC lipsticks (and other stuff) – what do you think of my lipstick choices? Side note / question: when you shop for lipsticks, do you just swatch them on your arm or do you try them on your lips? PLC says she only swatches them but I like to try them on my lips so I can see how they truly look and feel on my face! What about you? Next > Back to School and Organizing with MUJI! Good choices and score on the eyeshadows! I normally only swatch on my hand and I pretty much know instantly if I like it/whether it will suit me or not, I’m a very gut instinct person when it comes to makeup! My friend and I are very much into buying random stuff for each other, even when it’s not our birthdays, lol! I used to swatch on my hand only but it was difficult to see how it’d look on my face – my hand is usually darker than my face. And my lips are quite pigmented so it often throws off lipstick colours. O, Stashy… your ‘no buy’ ship has just sail and sank 😛 You’re not alone in this MAC weakness *LOL* For MAC skincare I’ve only tried their cleansing oil. Their skincare range doesn’t call me? haha Will be good to know of your verdict on this one. I swatch lipsticks on my inner wrist. I swipe it next to a similar hue/tone from one of the lipsticks that I already own. I am too chicken to swipe any tester on my lips. I wait 5min or for dry down. I wipe with tissue lightly and reapply to see if it reapplies well. Well it was only the concealer that would break my No Buy! Skincare, body care, hair care doesn’t count – only actual MAKEUP items. I have too much makeup as you know. I was in panic mode because I was literally getting by on gwp samples for face creams! 😛 So I’d argue it was a NEED. Same with that concealer. Hmm maybe I’m weird that I apply them to my lips – the MAC girl sanitized them for me first of course! I used to be REALLY germophobe… like I’d think too long about how bread was made and think about how the bakers’ skin would flake off and get rolled into the dough… stuff like that. I’m a WHOLE lot better now. But I’m still cautious. HELLOOOOO! You were so helpful – thank you! ❤ I'm wearing Brave today because I have a presentation to give. FEELING BRAVE! Awesome choices! Good job PLC! Lol. Not that those lipsticks aren’t beautiful, but now I gotta check out that Extra Dimension shadow in Smokey Mauve! YAY Brave! It looks so pink against you, I’m beginning to wonder if mine has gone a weird colour over the years and when I come to rebuy it when I run out I’m going to be bitterly disappointed ha! Ravishing… now on my list! I’m with Joyce with the swatching on the lips, defo not a common thing to do in the UK, but that’s maybe down to them being disrespected by everyone in stores like Boots and Superdrug – I don’t even like leaving them on my arm for long that’s how gross they normally are. Probably in a store like MAC i’d be more likely to, but it seems so alien because of other stores being so gross! Yes, at drugstores / Sephora I don’t typically just pick up their tester and apply them to my lips. But at counters where you can actually see them sanitize the products, then yes. Even at Sephora the SA will sanitize the products (or you can do it yourself with the bottles of alcohol they have lying around). Excellent choices! Both of these shades are so pretty. In the bullet next to UD Rush, Brave looks like it would be a dupe…didn’t realize how pink Brave actually is! It looks a lot mauvier in swatches I’ve seen. And omg, that Smokey Mauve shade is perfection! I’m a big proponent of trying lipsticks on before purchasing! When I first started getting into lipsticks, I would only swatch them. While a lot of the colours were pretty/felt good when swatched, it would look terrible or be too drying on my lips. I was surprised how pink Brave is too! In my mind, I thought it’d be too similar to Cosmo, or UD Rush. And yes, it’s not all that mauve in real life! I think maybe the “white pearl” finish reflects light so it looks lighter too. If you want mauve, get Twig for sure. Glad I’m not the only one who tries on the lips. My lips are so pigmented, some colours don’t show up as they do on the bullet or an arm swatch. And yes, the formula – it’s not possible to feel how drying it can be unless it’s on the lips. Both lipsticks are gorgeous- I’ve heard that Brave is a popular choice, although I don’t own it….yet! I love that you brought a baggie of other lipsticks you own with you, that’s a great idea- I would never remember to do that though haha. When trying on lipsticks, I like to try them on my lips- that’s where we will be wearing them anyway, right? It’s just the best way to get an accurate color I think. Brave is a hugely popular choice. If you don’t own that, you either own Twig or Velvet Teddy! Those seem to be the top MAC lippy colours. I agree, on the lips is the only way to tell if the colour will appear true to how it appears in the bullet. Plus, you can a feel of the formula too. It’s very wearable, that’s for sure! I have yet to bring my empties over to M.A.C. 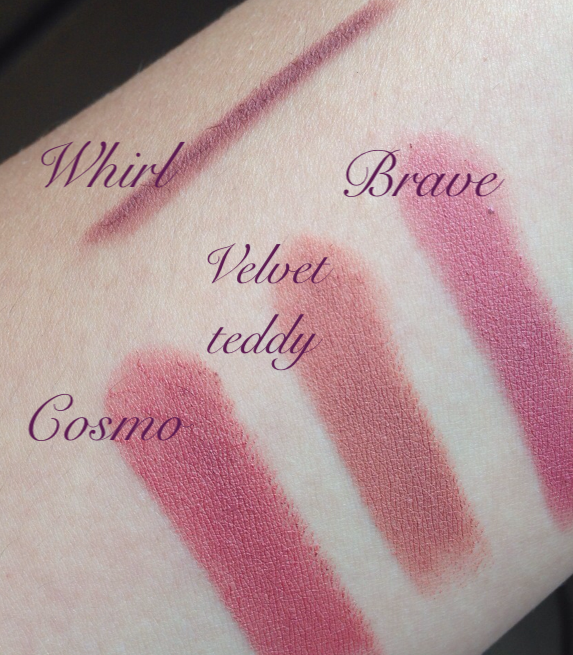 Definitely want a lipstick and was considering Whirl, BUT I might have to swatch Brave before I make a final decision. Whirl is MUCH darker and browner. In comparison, I think Brave is the pinkest, brightest of those KJenner lip colours (Velvet Teddy, Mehr, Twig, etc etc). This is the 4th time I’ve done Back to MAC. I wish other brands offered something like this! Haha you made a rhyme! 😛 Brave feels very comfortable on the lips too, which is so important to me! I’m so glad you got Brave, now you get all the hype!! I usually only swatch on my arms (well, I fill my arm with swatches but still…) but if I’m really torn between colors I’ll try them on my lips so I can get a better idea! I didn’t used to test them on my lips but I got tired of getting lipsticks that all end up looking hot pink on my lips. I only test them on my lips at counters where they can sanitize. At drugstores, no way! That’s kind of what I figured lol. I definitely wouldn’t test them at drugstores but I will admit I do swatch them if they’re already open (not the ones that haven’t been touched though). Ooh, I like Brave – it’s really pretty. I like the bit of cool to it. It’s a tiny bit mauve but not dull looking, I really like it. Ooo! Brave looks so pretty! I don’t think ravishing would suit my skin tone but I does look really pretty searched as well! Nice choices! Thanks! Ravishing is quite warmed toned. Maybe Fanfare would suit you? It’s more pinky toned. MAC has so many options, it makes for lots of choices but also difficult to choose! Can’t go wrong with Brave and Soft Brown! And now I need to check out Ravishing next time I’m at MAC counter. Brave and Soft Brown should probably go on a “must have” or starter kit from MAC, they’re just so classic. Definitely give Ravishing a try – really easy to wear and perfect for summer! Ravishing looks absolutely amazing! What a great shade, will definitely be swatching that alongside brave which has been on my to swatch list for forever (the last few times I was near a mac counter it was overrun by teenagers, so I gave up). I think Ravishing would work well with your skin tone! Haha, there are times when the MAC stores are so busy I just walk right back out – there’s no one to help and all the testers are messed up! I think Brave would look really good on you! Yeah, your hubby showed a lot of patience with you in the State. Well at least you can always get it at a MAC store in Canada… however many hours that is from you! I usually end up in Toronto 1-2 times a year so I’ll let you guys know next time I have a trip planned! I think I definitely need to experience a Cat/Stashy makeup shopping trip! Next Canadian trip is actually in 2 weeks. My husband and I are driving out West! Thunder Bay is beautiful, not great for makeup shopping at all, but it’s a beautiful city! Lots of great outdoor things to do! So, it has its perks! I visit MAC way too often, mostly just to browse their frequent collections. 😛 I’ve been so shocked to see that MAC has reduced their prices and even have had sales! Yes, MAC has been offering sales on certain items at certain times! I was SHOCKED. In all the years that I’ve bought MAC, I think 2015 was the first time I ever saw a sale by MAC. Sweet, I’ll have to keep an eye out for their sales! Great choice! All the color looks flawless ❤️💕. These are both such lovely shades! I’ve added them to my never ending list of lipstick that I want in my life lol. I always swatch lipstick on my lips as well. I imagine that this is true for a lot of people but lipstick looks 100% different on me than I expect it to. I can also stand side by side with someone wearing the same lipstick as me and the shade will look completely different. So I don’t really trust hand swatches on their own. Exactly, however the colour appears in the bullet or swatched on my arm will NOT look like that on my lips, ever. I guess I’m just sick of getting home and being surprised / disappointed by the lipstick colour on my lips. I’m currently using this one. It is truely a good product. It’s a classic, you can never go wrong with MAC lipstick! I can’t believe you don’t own a single MAC lipstick! I think Brave would be nice on you although it is pinker in real life than I thought it would be. If you’re looking for other MLBB shades, definitely look at Twig, Fast Play, Cosmo, Mehr and Mocha!